Big things come in small packages. We’ve all heard this widely overused catchphrase, whether it be in the high school hallway before a fight or on television describing a small-in-stature athlete. We have all had instances in our lives that have convinced us that truly a person or a thing can’t be judged by its appearance, and a closer look on the inside of something can reveal a great deal of value. However, I haven’t always known this to be true in every instance. Sometimes things are just small, and they don’t pack a punch. Sometimes we expect certain smaller things to be greater than what they really are, and the proverbial ‘cover’ has actually been judged accurately and effectively. Such is the case with the Yamaha Piaggero NP-11 piano. I hesitate to even fully label it a digital piano, as there are many characteristics of the NP-11 which lead me to believe that it’s nothing more than a glorified keyboard. Below, please enjoy the interactive guide that was created to make your piano purchase easier. Compare the affordable Yamaha NP-11 to the best pianos in its class based on weight, price, and even customer reviews from Amazon.com. Please note: We have recently reviewed the Yamaha NP-12, the successor to the popular NP-11. 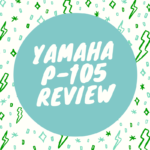 This review of the Yamaha NP11 will break down the pianos’ specs and features, and throughout the article, what you’ll notice in particular is that we opt to compare it strongly to the Yamaha NP31. That’s because the NP11 is essentially a smaller version of the larger NP31, and therefore that have some similarities, but also some differences, as well. Yamaha NP-11 vs the NP-31? The NP-11 is the younger brother of the Yamaha NP-31, and is in fact just a miniature version of it. It retains a large portion of many of the same characteristics, and in truth, its size and cost are just about the only thing that separates the two. So it’s safe to say that any good or bad experiences with the NP-31 will justifiably translate to the NP-11. The Piaggero line of pianos from Yamaha is one that emphasizes portability and style, and the NP-11 and NP-31 are two of the first and main installments of the line. 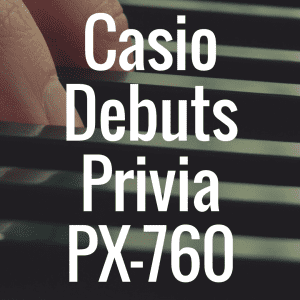 Piaggero is actually a cleverly coined name by Yamaha which joins ‘piano’ and ‘leggero’, the latter being Italian for ‘light.’ The 61-key NP-11 is just that, weighing in at a mere nine pounds, fifteen ounces. Just forty inches long and ten inches wide, it’s certainly one of the lightest and most compact pianos I’ve ever come in contact with. I do like the nice, sleek, simple piano style feel of the machine, with a uniform all-black finish and a nice red trim lining the beginning of the keybed. The NP-11 surprisingly has the same size speakers as the NP-31, both having two twelve by six centimeter speakers. It’s the amplifier wattage of the NP-11 which doesn’t measure up, dropping from six watts to 2.5. It still gives off a pretty decent sound considering the machine’s size. The power consumption is handled by the PA-3C adaptor, but just like the NP-31, it doesn’t need it. The NP-11 can be cordlessly powered by six AA size batteries, which will keep it running for around six hours. However, unlike the NP-31 some NP-11 bundle packages will come with the adapter. The sounds are generated using Yamaha’s proprietary Advanced Wave Memory Stereo Sampling technology, which is the first installment of Yamaha’s tone generation engineering. With only 10 preset voices and a maximum polyphony of 32 notes, there isn’t much work for the sampling system to do. Once you sit down to play the piano you can notice an immediate drop off in quality from some of the other digital pianos, but it is still able to produce a pretty decent sound. The ten voices consist of two grand pianos, two electric pianos, two pipe organs, two harpsichords, a vibraphone and a strings section. 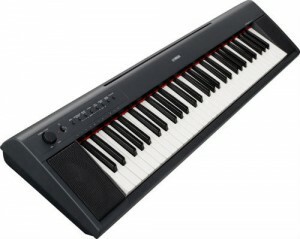 The NP-11, just like its older brother does not have an impressive keybed with graded hammer action, like so many other Yamaha digital pianos. The description of the piano in my opinion is a bit misleading when it says ‘piano-style keys.’ These keys seem to be a bit smaller than real piano keys, and they certainly aren’t weighted or graded like them. They do have varied touch response, so the NP-11 will pay attention to how heavy or how light you play the notes. The NP-11 only has one headphone jack, which is a bit disappointing considering the starter/entry level feel it has as a machine. I know many people who choose a machine like this aren’t expecting much, so they want something they can practice on and hone in their craft. For a machine like this I would expect the double headphone jacks, which would help with a private teacher-student session where maybe it was late at night or the student didn’t want to be heard. The NP-11 works well as a MIDI controller if you’re trying to connect with other MIDI instruments or computers. However, just like the NP-31 there does seem to be a bit of confusion on deciding how much MIDI capability the machine truly has. 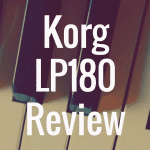 The fact is it is surely not a master keyboard, but it is MIDI capable enough to control up to 16 channels. Also like the NP-31, the NP-11 has 4 different types of reverb. This is just enough for my tastes, and the effects can give off a smaller room feel or one of a grand concert piano hall. It also has dual and layering functions, which will allow you to place a nice grand piano sound on top of a beautiful strings section. Unfortunately there is no chorus effect to give it a nice, full sound. The NP-11 also comes with the 31’s ECO energy saving mode, which is an innovative feature that shuts off the machine automatically after it’s been idle for more than 30 minutes. This is great, especially if you’re going to be using the battery feature, so that you can effectively save battery life. Just like the NP-31, you either love or you hate the NP-11. You love its portability and the effectiveness of such a small machine, or you hate the fact that it does come a bit on the cheaper side and may not provide all of the features you were looking for. Whatever side you stand on, the NP-11 is still a pretty decent buy at its price. At retail it will go for $270, but on sites like Amazon.com and KraftMUSIC you should be able to find the NP11 for less than $160. 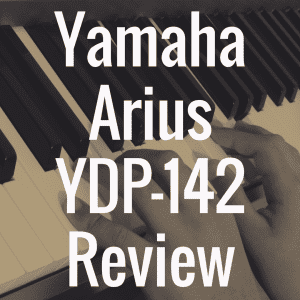 If you’re a Yamaha digital piano enthusiast, be sure to read my other Yamaha reviews below. 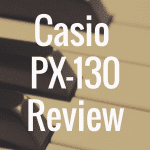 And please visit our homepage for more digital piano reviews.